Glazing fish enhances the flavors of the seafood. Ginger glazes work well with fish that have strong flavors and firm flesh, such as salmon, mahi mahi, and tilapia, because the fish holds up well to the strong flavors in the glaze. The glaze below hits all of the important flavors, including sweet, sour, salty, umami, heat, and acidity, making it a complex and interesting glaze. 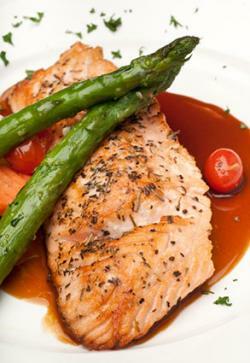 Although this recipe calls for salmon, you can replace it with another firm fleshed fish, such as mahi mahi or tilapia. The main recipe calls for grilling the fish, which allows the glaze to caramelize. However, there are variations included for baking and pan searing. Serve the finished dish with a side of asparagus and cherry tomatoes. Use fresh ginger for best results. In a small, flat dish, wish together the soy sauce, honey, rice vinegar, ginger, garlic, and sriracha. Place salmon filets into the marinade flesh side down. Refrigerate and marinate for 30 minutes. Remove the salmon from the glaze for grilling. Pour the marinade into a small saucepan and simmer over medium-high heat until it thickens, about five minutes. Preheat your grill for indirect heat on medium-high. Lightly oil the grill with olive oil. Place the salmon on the grill, flesh side down and allow it to grill for about four minutes, until the salmon begins to turn opaque. Flip the salmon and grill on the other side, and additional three minutes to cook the fish all the way through. Brush the flesh with the glaze. Flip the salmon one more time and allow the glaze to cook, about two more minutes, or until the fish is firm to the touch, opaque, and cooked through. Add the parsley to garnish the dish, if desired. Make the glaze and marinate the salmon as indicated above in steps one through four. While the salmon marinates, preheat the oven to 400 degrees. Place the marinated salmon on the baking sheet, leaving plenty of room around each piece of salmon. Brush the top of each filet with the glaze. Bake the salmon in the preheated oven for 10 to 15 minutes, until the salmon is opaque and flakes easily with a fork. This variation allows you to cook the recipe on the stovetop. For best results, use a nonstick or cast iron sauté pan. Follow the above recipe for the salmon and glaze, using steps one through four. Heat two tablespoons of olive oil in a 12 inch nonstick sauté pan over medium-high heat until it shimmers. Put the salmon in the hot oil, skin side up, and cook until the flesh begins to caramelize and brown, about four minutes. Flip the salmon and cook on the other side, another three to four minutes. Brush the flesh with glaze. Flip the salmon once more and allow the glaze to caramelize, about two minutes. Replace vinegar with fresh squeezed orange juice. Replace vinegar with fresh squeezed lemon juice. Replace vinegar with balsamic vinegar. Add 1/2 teaspoon of fish sauce for a deeper umami flavor. Replace sriracha with a pinch of crushed red pepper flakes. Replace the honey with molasses for an earthier sweetness. Replace the honey with pure maple syrup. This is especially delicious if you also replace the vinegar with orange juice. Sprinkle the glazed, cooked fish with toasted sesame seeds. Glazes add wonderful flavors to fish. Try this ginger glaze, or variations of the glaze, the next time you make seafood.